Simply stated, the liveaboard diving experience combines all the elements of dive travel into one. Imagine a dive vacation where your hotel, restaurant, lounge, and dive operation are all within 20 steps of each other! You will find that diving from a liveaboard represents the easiest diving that you will ever encounter from a logistics standpoint. Imagine waking up in your room and walking 20 steps for breakfast, and then walking another 20 steps to the dive deck where your gear is always ready, and you’re just a giant stride away from your first dive of the day. 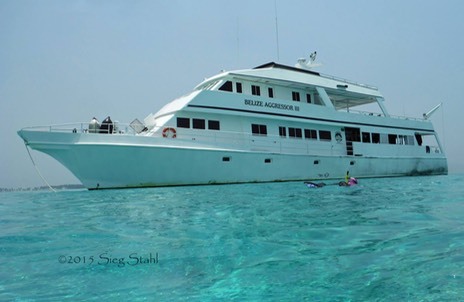 The expression “eat, sleep, dive” is what liveaboard diving is all about. 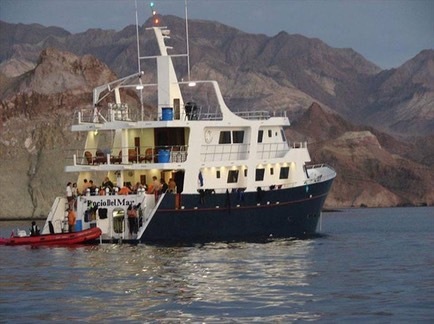 Liveaboard diving is available as an alternative at many of the most popular dive destinations and there are even some destinations that are only accessible via liveaboard vessels due to the distance and remote location of the actual dives sites (i.e., the Coral Sea, Socorro Islands, etc.). And some popular destinations (like Belize & the Sea of Cortez) have great diving but popular dive areas can sometimes require long boat rides, and in some cases mean that you must give up some dive opportunities in order to allow for travel time via the day boats. Liveaboards often allow us to access more pristine and less visited locations because those sites are beyond the practical range of day boats. Is a Liveaboard for me? I personally enjoy all forms of diving and I love land based resorts as well as liveaboard diving. Rather than try to compare land vs. liveaboard diving and decide which is better, let’s break it down and explore the liveaboard experience in a little more detail so that you can decide for yourself whether spending a week at sea makes sense for you. In conversation about liveaboards with fellow divers who enjoy travelling to great dive destinations, the first thing that usually pops up is the price. I understand that these days most of us are cost conscious and looking for a good value for our hard-earned dive vacation bucks. 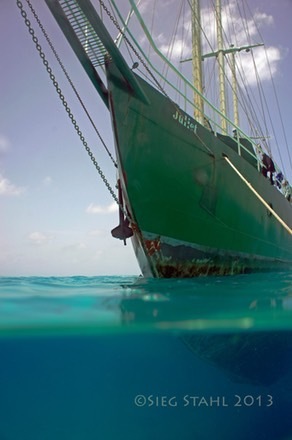 So when you initially see the price of that 7 day liveaboard in paradise, don’t go into immediate sticker shock! Before you hyper-ventilate from seeing those dollar signs, do some objective math. That price actually covers not only your diving, but also your “hotel” cost and ALL your meals (and usually that after dive nightcap too). But wait, there’s more! When you consider that most liveaboards offer you the opportunity to do 4 or more dives per day, and you calculate the total cost per dive, suddenly you come to realize that the price is not nearly as scary as you first thought. In fact, if you are there to take full advantage of the many dive opportunities offered, it may surprise you to find that it turns out to be quite a bargain when compared to diving from land based resorts. Let’s get back to the subject of those onboard meals for just a moment. You might be surprised to learn that most liveaboard operators pride themselves on the quality of their food and the skills of their chefs. So when you think about onboard meals, don’t interpret it as merely ample portions of hearty food, we’re actually talking about some great dining experiences! And did I mention that they even provide snacks between meals. I’ve been treated to everything from cheese, fruit, and crackers, to warm fresh baked cookies & pastries right from the oven. Suffice it to say that the onboard dining experience will not disappoint. On a recent charter aboard the Rocio del Mar to the Sea of Cortez, the days started early with a cold breakfast, a dive, then a hot breakfast, a dive, then a hot lunch, a dive, then afternoon snacks, followed by an excellent dinner, a night dive, then sleep and repeat! If you are someone that appreciates having maximum dive opportunities, great food, and good company, then nothing beats a liveaboard. It’s simply heaven for those who enjoy the “eat, sleep, dive” lifestyle. But life onboard is also pretty laid back and easy going, so if you would like to sleep in, or call it an early day, no worries, it’s all your choice! Let’s focus on logistics for a moment as it relates to dive sites. 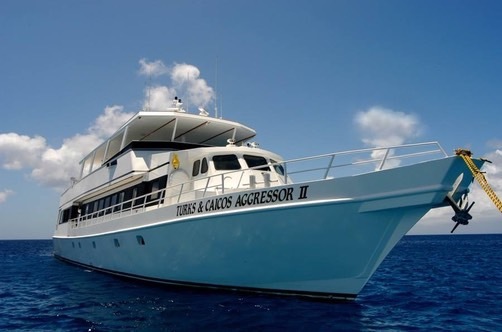 One big advantage of liveaboard diving is the far reaching range of dive sites that are accessible because your “hotel” room is able to travel to where the dive sites are. Just think about it. Liveaboard vessels often move during the night while you sleep or while you are enjoying a little surface interval siesta or meal, so you get to experience a wide range of sites (based on weather and conditions) without having to give up dives to get there! To give you an idea, during our last Australian charter in the Coral Sea with Mike Ball, we covered 700 kilometers and were provided with an amazing diversity of dive sites and experiences. Liveaboards come in various configurations and hull types, but when it comes to the actual dive operations, it just doesn’t get any easier. Most liveaboards have an ample dive deck so that all the gear lives there for the week and not in your room. And the dive deck is just a few steps away from the water entry & exit. Once on board, you mount your BCD onto the tank at your dive station and then never touch it again because whether you dive Nitrox or air, the long fill whips are able reach the individual dive stations. That means the tanks are filled in-place without the need to dismount the BCD…..very cool! The dive deck on most vessels has storage space for other gear and a place to hang wetsuits for drying. Photographers will be pleased with the dedicated camera table and charging stations that are available on most liveaboards. While diving generally takes place right from the liveaboard vessel itself, there are some situations that require diving from smaller inflatable boats (RIB’s) when it’s not possible for the larger “mother ship” to get in close to the dive site. In addition to what most divers would consider a great diving and dining experience, I have also generally experienced outstanding service, from special requests and celebrations to hot towels handed out after a dive. Eat, sleep, dive…..it just doesn’t get any easier. But I am also one who appreciates that great service and I tip the crew accordingly. The recommended norm would be 10-15% of the charter cost, but remember that it actually covers all diving, meals, and lodging for the week. Is there a Downside to life at sea? While I love boats and would hardly consider these as negatives, it only makes sense to do a little personal reality check in order to set the proper expectations before you sign on to go to sea. Let’s start with the number one fact….it’s a boat!! Don’t expect your cabin to be the size of the Presidential Suite at the Ritz. It’s really just a place to sleep and keep your personal stuff. Prepare yourself to spend a week with your “closest” friends - the boats look big, but you’ll be spending lots of time in close proximity with other adventure seekers, so lighten up and make some new friends. Will you get seasick? Perhaps, so don’t push your luck. Come prepared with pills, patches, or bands just in case, and use them “before” you feel ill. The good news is that most people don’t, and if you do, it’s usually only the first day. You won’t be island hopping from shopping mall to shopping mall while underway. Even though liveaboards are very well equipped, come prepared with everything you need (especially meds & gear) for the week and use a checklist. Life onboard is pretty casual, so resist the temptation to impress the crew with a wardrobe change at every meal. Pack light and use soft sided luggage so it can be easily stowed away for the week. Unless your non-diving companion is a voracious reader and really enjoys just relaxing on deck, they might be a little unhappy with the prospect of little or no sand between their toes for a whole week, so make sure that they are really ready for a week at sea before you book a cabin for two. "My non-diving companion said no way", so why do I need to pay so much extra if I want a single cabin? Unlike land based resorts, the costs on a liveaboard are relatively fixed so empty spots are financially painful. Consider inviting a diving friend or let the charter find someone to share with you….after all, that’s how new dive buddies are made. Will my cabin have a private toilet & shower? The answer is generally yes, but there are some that have shared facilities so if that’s a deal breaker for you…check ahead before you book. So if you love diving and are up for an amazing adventure at sea, I would encourage you to seriously consider a liveaboard. But like with all dive travel, you’ll need to do some homework and research in advance. If it’s you first liveaboard experience, you may not necessarily want to choose a destination that requires an extended passage to get to the dive area until you’re sure about your “sea legs”. But if you’re like most of us, once you have experienced the joy and ease of diving from a liveaboard, you will be completely spoiled and ready to book another.